More than 120 associations providing disability services have called on the United Nations and the world to intervene quickly to stop the war on Yemen. The associations affiliated with the Yemeni National Association of Disabled Persons said that the crimes committed by the Saudi regime along with the UAE and many other regional states participating in the conflict have affected all Yemenis without exception, leading to the damage of Yemen’s present and future, which is already known for being on the verge of the largest famine in recent history. This came during a march organized by the Union in front of the United Nations headquarters in Sana’a, with the participation of members from over 120 associations working in serving the disabled in its various categories, on the occasion of the United Nations International Day of Persons with Disabilities (IDPD). The statement declared during the event stressed that the war and the Saudi-UAE aggression against Yemen caused the disabled many problems and obstacles, perhaps the most important of which is causing more disability for thousands of people and the scarcity and reduction of financial resources that was Funded for the care and rehabilitation of the disabled through which one million disabled people were benefiting from for their training and their treatment. The statement added many associations, unions and centers of rehabilitation and training of people with disabilities have been affected or/and damaged in all governorates in Yemen. The war launched by Saudi Arabia on the impoverished country imposed more restrictions on the freedom of traveling of all Yemeni people by closing Sana’a international airport, the moving of the central bank into Aden and the stop of salaries for years, which impacted most the people with disabilities; thus violating one of the vital human right laws that every Yemenis should enjoy. 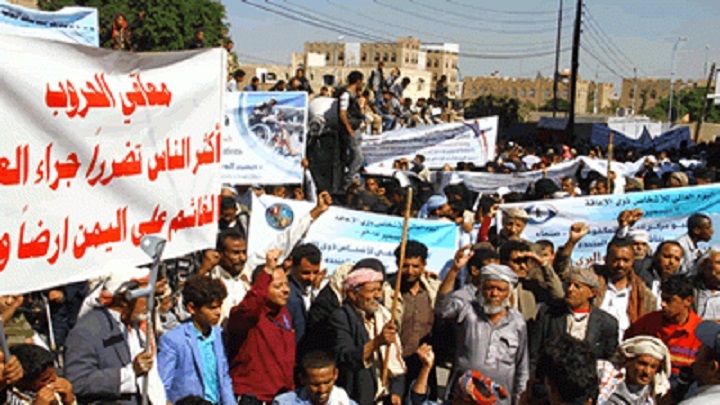 During the event, the participants urged the international community to respond to the demands of the disabled and to send their voices to various UN bodies in order for the worst humanitarian catastrophe to end and the Saudi military campaign is forced to immediately stop its brutal attacks on the people of Yemen.